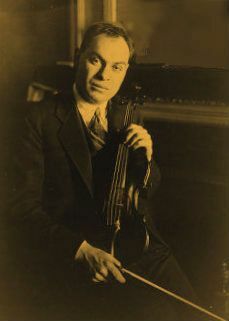 Eddy Brown was an American violinist, teacher, and radio pioneer born on July 15, 1895 (Brahms was 63 years old.) His father, with whom he had his first lessons, was Austrian and his mother, Russian. He later studied with Hugh McGibney in Indianapolis while still a child. He is known for having launched and hugely influenced classical music radio programming in the U.S. In fact, he gave the first radio performance of all ten Beethoven sonatas. In 1936, he pioneered radio station WQXR in New York City (devoted exclusively to classical music) which survives to this day. His first public appearance as a violinist was at age six. At age nine (1904), he enrolled at the Royal Conservatory in Budapest where he studied with Jeno Hubay, Bela Bartok and others. Two years later, he took first prize in the Budapest Concerto Competition. Eugene Ormandy took second. Brown graduated in 1909 and soon after made his formal debut in Budapest playing the Beethoven concerto. That same year he made his London debut with the London Philharmonic playing Tchaikovsky’s violin concerto – he was fourteen years old. His Berlin debut came in 1910 with the Brahms concerto. He then studied further (until 1916) with Leopold Auer at the St Petersburg Conservatory and concertized world wide for some time after that. His U.S. debut was at Indianapolis in 1916 with the Beethoven concerto. He made his New York debut that same week. He began to record (if one can call it that) in 1916. He also formed a string quartet (name unknown) and established the Chamber Music Society of America. After becoming involved in radio in 1930, he essentially stopped touring, though he played for many of the different radio programs which he created and in various venues close to New York. Ironically, almost none of the hundreds of performances he gave on radio survive. Brown started to teach at the University of Cincinnati in 1956. He was named Artist-in-Residence of Butler University (Indianapolis) in 1971. His only modern recording was of a violin concerto by Mana Zucca, which few people have ever heard. A complete recording of it is posted on YouTube, if you should be curious, as are other Eddy Brown recordings. Brown died unexpectedly (in Italy) on June 14, 1974, at age 78.